Squaw Valley California near Lake Tahoe is an idyllic luxury resort area, once the site of a winter Olympic Games. Located in Placer County it is the home of the Squaw Valley Ski Resort, the site of the 1960 Winter Olympics. Squaw Valley USA is the perfect resort for those that love skiing and snowboarding. Other activities include ice skating, tubing, scenic cable car rides, hiking, biking and various other fun things to do. Squaw Valley was once a mining boom town and was the biggest mining operations in the Lake Tahoe region. Located in Placer County it is the home of the Squaw Valley Ski Resort, the site of the 1960 Winter Olympics. It is the smallest place in the world to ever host the Olympic Games. Squaw Valley is located in Placer County northwest of Tahoe City along Highway 89 on the banks of the Truckee River near Lake Tahoe. Squaw Valley Resort itself offers over four hundred suites and guest rooms, some even with full size kitchens and living rooms, all catering to the warmth of home. Homeowners and visitors are able to enjoy renowned service and hospitality. To top that off they have access to lodges, skiing, a golf course, a cross country skiing center, an ice rink, fly fishing area, whirlpools, salon, banquet facilities, pool, biking/hiking trails, waterslides, and so much more. Other perks include a shopping mall, multiple restaurants, event and business facilities, fitness and health center, spa, mountain biking center and even a specialized program for kids. Dining choices include grilled, Western American, barbecued, Italian and even classic continental cuisine. Full-service bars and wine facilities also make for a special treat with locally brewed beers, local winery wines and exceptional pub food. The Olympic Ice Pavilion, accessed via Squaw Valley's aerial Cable Car, is a true wonder. Perched at the crest of Squaw Valley's upper mountain, the rink offers unmatched panoramic views of the Squaw Valley Meadow, beautiful Lake Tahoe and the surrounding Sierra Nevada. Located at High Camp the Swimming Lagoon and Spa are surrounded by the beauty of the Sierra's including views of Lake Tahoe. Two tubing lanes are maintained providing tubers a variety of thrill levels. The snow tubing park is located at the Papoose Discovery Center at Far East. Wilderness Adventures offers hour-long dog sledding tours through the beautiful Squaw Valley Meadow. A racing guide leads a team of eight - ten Alaskan Huskies and guests ride in a four-person sled. No matter what the weather or your ability level, you’ll have a blast climbing the variety of routes and 30’ high simulated rock surface at the Headwall Climbing Wall. Hook the bungees to your harness – start jumping on the trampolines – and soon you’re bouncing 25’ in the air while performing somersaults and flips! The Resort at Squaw Creek offers a complete Nordic Center, conveniently located at the trailhead of the Cross Country Ski & Snowshoe trails at the Resort at Squaw Creek. Starting from The Village At Squaw Valley you can bike through Squaw Valley on the paved bike trail. Continuing on from Squaw Valley you can follow the bike path all the way to Tahoe City. This is a very popular, scenic path with the Truckee River lapping at the edges of the paved trail. Provides access to fishing, picnic areas and river rafting. The trail continues on from Tahoe City if you are interested in a longer ride. From Squaw Valley there is also a designated bike lane on Highway 89 to West River Road in Truckee. The Cable Car features ultra-modern cabins, interior seating, and floor-to-ceiling panoramic windows offering expansive views of the beautiful Sierra Nevada and Lake Tahoe. This 18-hole Robert Trent Jones Jr. championship golf course at The Resort At Squaw Creek sits serenely at the base of Squaw Valley USA. 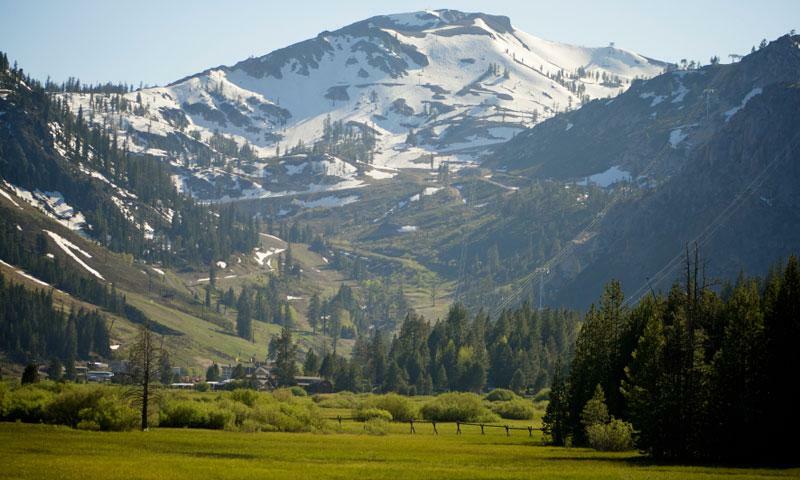 Explore the beautiful valley by hiking some of the most scenic sections of Squaw Valley. Hike up Shirley Canyon or start you hike at elevation 8200' from High Camp, there are many vistas for you to discover. Open daily throughout the summer season, ice skating is available for all ages. Hockey or figure skate rentals are included, and private lessons are available by appointment. A handful of the most peaceful and spectacular tennis courts in the world are cradled on a ridge top at el. 8,200? and accessed by Squaw Valley’s scenic aerial Cable Car. Learn about the 1960 Olympics that took place right here at Squaw Valley! Located at High Camp, admission is free with your Cable Car ride. A ride in the scenic Cable Car is a spectacular and leisurely ride 2,000 vertical feet to the High Cam, el. 8200'. The Cable Car is one of Squaw Valley's most popular year-round attractions and is open to all guests, skiers, snowboarders and walkers. A gathering which happens in July each year that brings in accomplished yoga teachers as well as many well-known musical performers. Each August authors from all over the world gather at Squaw Valley. To travel to Squaw Valley from Truckee CA, take Interstate 80 west for approximately 1.5 miles. Then turn onto California Highway 89 and travel an additional 9 miles. The entire trip will take you about 20 minutes. Fresno County encompasses a large section of central California and is home to Squaw Valley.